Since the advent of online journalism, social media, and the increasingly partisan landscape of cable news, Americans have started to do something that researchers call "self-segregating" when it comes to learning about politics and current events. Many of us are watching, just not together: according to a recent Pew Research Center analysis of Nielsen Media Research data, the 2016 presidential election has led to an 8 percent jump in prime time viewership of cable news. The revenues for the three major channels, CNN, Fox News Channel, and MSNBC, are projected to increase by 10 percent to about $4 billion this year. That's certainly good for TV, but it's probably not good for us. This election, which has been punctuated by a shocking normalization of bigotry and the steady drumbeat of rambling, late night tweetstorms, has been more acrimonious and polarizing than any in recent memory. Whatever the results on election day, the political climate is likely to remain fraught. What can be done? A group of optimistic artists have launched a project designed to provide a model for how communities can counteract partisan polarization: The Democratic Cup. 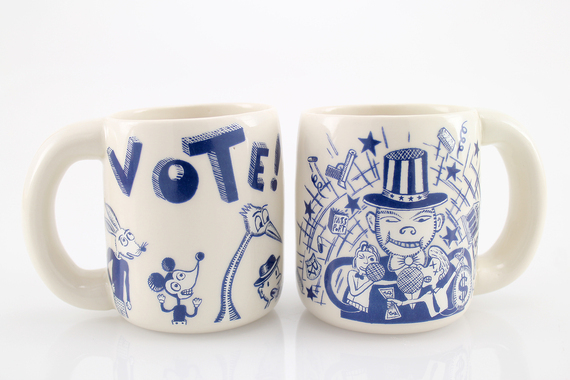 Maine-based Ayumi Horie and North Carolina-based Nick Moen have gathered a group of twenty-six stellar illustrators and ceramic artists, and together they have designed limited-edition porcelain cups decorated with imagery designed to encourage conversation and inspire hope for finding common ground during the election season. Their aim is to raise $100,000 from sales of the cups to benefit a group of non-profit organizations that focus on gender equality and women's health, combating systemic racism, immigration reform, gun reform, LGBTQ+ rights, and climate change. Each one is handmade in North Carolina by The Bright Angle Studio, and has an original design. You can read more about the artists, causes, and cups here. Each artist involved drew inspiration from something slightly different, but almost all of them had a similar thought about what an unassuming, humble cup of coffee (and the conversations that happen over it) can do. "A ceramic cup is an invitation to sit, to slow down," says Roberto Lugo. "What better place to bring a conversation than at one of the few moments in contemporary life that we are most likely to be at peace: when we sit to drink our morning coffee." For Birdie Boone, it's largely about conversation: "stories and statements are spun left and right, sure, but they also can be altered, taken out of context, or may just be plain old lies. Sit down with someone, have a cuppa and a conversation. Face to face, with no additional input. Listen. Be tolerant, thoughtful, open-minded. Find common good. We need more of that." And Lauren Gallaspy sees metaphor in every aspect of the Democratic Cup project: "A cup is a vessel, small but effective. This project centers around small gestures with a big aim for an election that will have an enormous impact on our future. This project honors those who carry potential, who seek sustenance, who wish to live a life of pleasure and productivity. The act and the object is small, but the consequences could not be greater." The subjects depicted on the cups are icons and conversation-starters. Mike Corney's VOTE! Cup, created in collaboration with East Fork Pottery, was inspired by an unforgettable moment from the Democratic National Convention this summer: "When [Obama] uttered the name of "he who shall not be named," the crowd boo'ed. His response? Don't Boo. VOTE." The Ruth Ruth Cup by David Gordon and Nick Moen celebrates the Notorious RBG, who is depicted in 18th century garb on one side and in her Justice's robes on the other. "Let's have a woman president already," says Gordon. "And while we're at it, more women supreme court justices, more women in power. 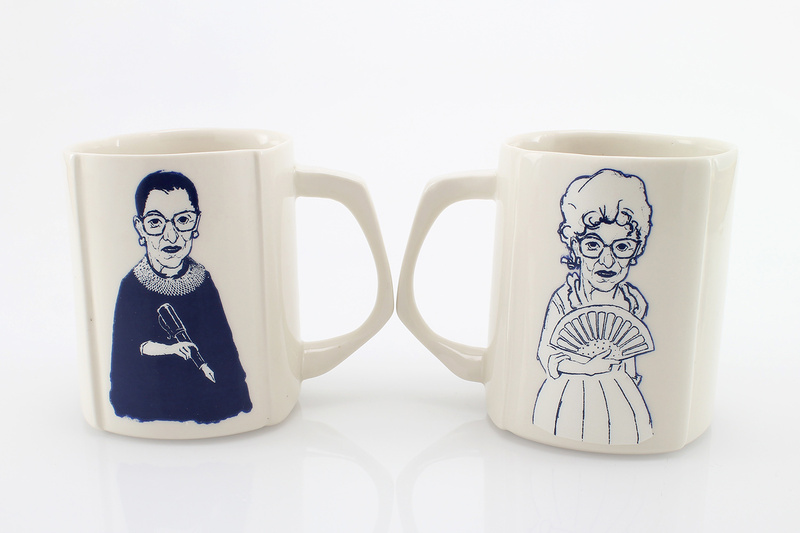 Especially women like Ruth Bader Ginsburg, with her quiet and towering intellect, and love of opera." 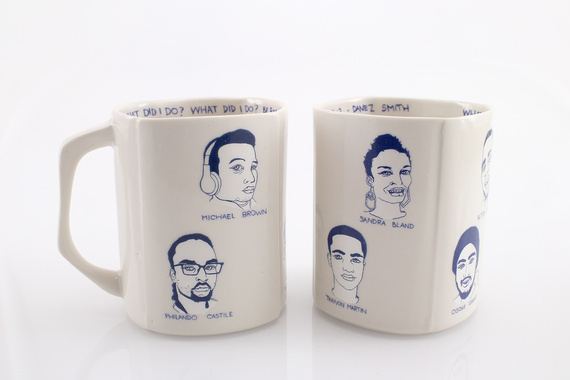 Klai Brown, Danez Smith, Nick Moen collaborated on a heart-wrenching cup called "What Did I Do," which depicts the faces of African-American men and women who have been killed by police officers over the past two years. Inside the cup, Danez Smith's text reads: "What did I do? What did I do? Be born? Be black? Meet you?" And Kristen Kieffer, who worked with Roberto Lugo, was inspired by the concept of Founding Mothers. 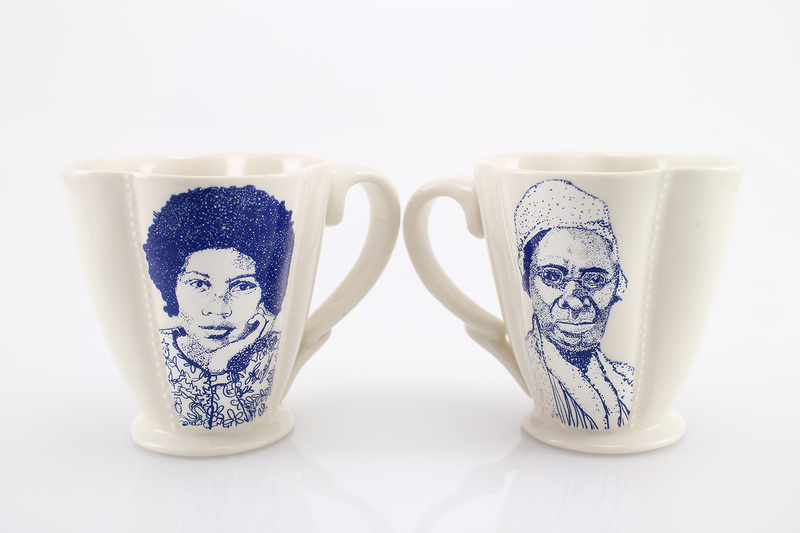 "Through the illustrations of two strong, African-American female activists, Sojourner Truth (1797-1883) and bell hooks (1952- ), who've fought tirelessly for suffrage, emancipation, and equality, we wanted to add an air of positivity and conviction to the contentious discussions during this presidential race, says Kieffer. James Klein and David Reid hope their cup warms hearts and minds. 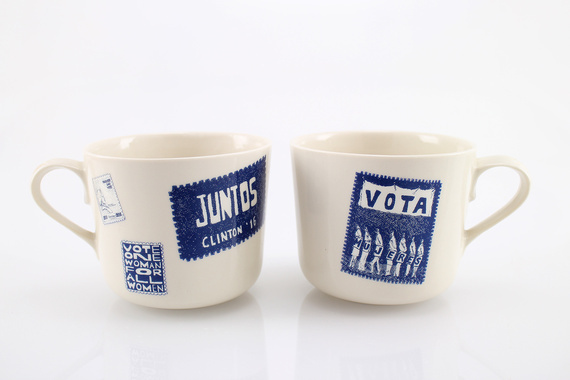 "We wanted to create a generous, go-to mug," they say, "friendly to the hands and lips," adding: "A friend's 7 year-old daughter was shocked and confused that there isn't an African American on the ballot for president this year. That's how quickly minds can change. 12 years of sustained leadership will change what a generation thinks is normal -- what they expect in a government."